Founded by Antonio T. Petrillo in 1907, today Petrillo Stone Corporation continues to supply, fabricate and install interior and exterior stonework throughout the New York metropolitan area for a distinguished client list that includes such landmark institutions, world-renowned retailers, and Fortune 500 firms as Lincoln Center, the Met, Columbia University, St. John the Divine, Gucci and JP Morgan. Grandsons Frank and Ralph Petrillo, brothers and co-owners, continue the legacy, ensuring that all fabrication and installation meets and exceeds the uncompromising standards of excellence established over a century ago. 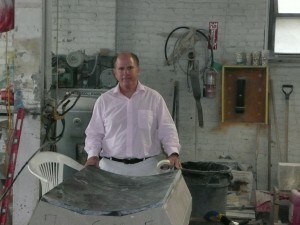 The company works with a wide variety of stones, all of superlative quality and imported worldwide – from across the U.S., Canada, Brazil, France, Spain, Portugal, France, Finland, Norway, China and many more global destinations — to the headquarters of this third- and fourth-generation family- owned business in Mount Vernon. All from Carrara Italian marble to Indiana and Jerusalem limestone to black granite quarried from Zimbabwe are delivered to the plant; then fashioned into intricate and ornate shapes: balusters, bases, columns, copings, cornices, dentals, headers, panels, quoins, railings, sills, watertables – and many more. All fabrication is performed on-site in the company’s state-of-the-art facility where almost forgotten art forms merge with cutting edge technology: Wireless control overhead cranes with up to 20-ton capacity hoist the immense slabs. Preliminary designs are sketched out through AutoCAD and other software applications. Petrillo Stone Corporation workers use digital photography to generate customized blueprints. Computer numeric control (CNC) machinery equipped with diamond saws hews the slabs. The stone is then worked on, sometimes sandblasted, other times sanded or honed, sometimes planed by 80-year-old machines then polished to a sheen. A highly skilled, international team of artisans achieve the finishes, and painstakingly cut and chisel until every inch has attained the desired peak of perfection. A few of Petrillo’s most historic projects are: Lincoln Center – where the company provided the original travertine that fills the plaza, Tiffany & Company where Petrillo replaced the interior marble, major restorations of the Verizon building and the Benjamin Hotel, the limestone façade and the interior marble of the flagship Gucci store on 56th Street and Fifth Avenue, the NY State Legislature, MetLife headquarters, Millennium Tower Residence, the Time Warner building, One Bryant Park/Bank of America Building, Fordham University, Columbia University, The Metropolitan Museum of Art, the Guggenheim, the Jewish Museum, St. John the Divine, the UN general assembly, GM Trump building, JPMorgan, Mutual of New York, Immaculate Conception Shrine in Washington, DC, and Rockefeller Center. In 2004, Petrillo Stone Corporation won the Marble Institute of America’s Pinnacle Award of Merit for the stellar project the company headed: the restoration of the Barclay-Vesey building severely damaged in the 9/11 attacks. The award read: “For outstanding creativity, ingenuity and craftsmanship that exemplify professional mastery in the use of natural stone.” It is a tribute both fitting and much-deserved, launching Petrillo into the 21st century.